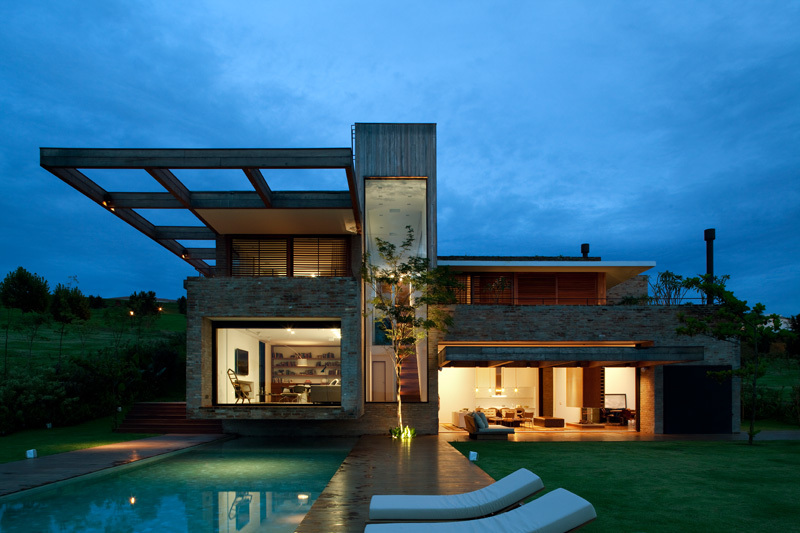 Stunning modern home in the country with a mix of bricks and stones in the exterior. Although it is challenging to design a home that sits on a hillside or in a steep sloping plot, many designers are still able to achieve a beautiful home that is at the same time functional and usable on a topogaphy like that. As a matter of fact, we have featured different homes that are located on hills and each designer has a different approach to the design depending on the needs of the owner. 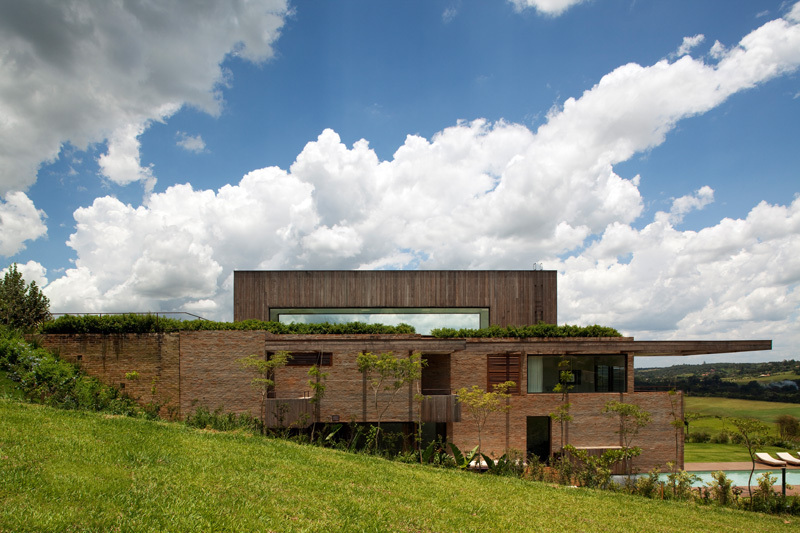 Today, we will feature another modern home which is located near Sao Paulo, Brazil that sits on a steep plot. 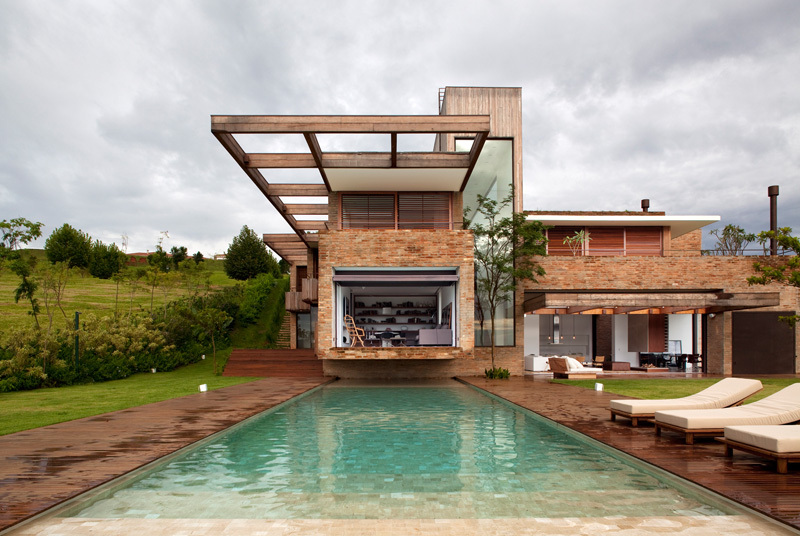 Casa MP is designed by Studio Arthur Casas for a young couple with children. The family wants a country house in a very steep plot. Said home is a thousand square meters, but remains almost unnoticable from the street. Total integration of the home’s architecture and the terrain was observed to create an innovative solution where the house is terraced. The levels gradually changes from private areas in the upper floors to common spaces in the lower levels. A large staircase within a wooden box is featured in the interior of the house that develop a straight line structure in the home’s program. The home also inlcudes a spa and home theater with a cantilevered box that works as a trampoline suspended above the swimming pool. Bricks that are used in the house are from previously demolished houses that give a rich texture to the area. The stones used here are perfect contrast with the wood used in the main stairs box and panels around the bedrooms. Let us take a look at the home below. Unique feature: A modern country house that sits on a steep plot. It used a combination of wood and stones for the exterior. You may not notice its sloping plot here but if you look closely, you will see that it actually has a sloped area. But I can tell that the house is indeed well-designed because of how this one looks like. It used a combination of materials as well. 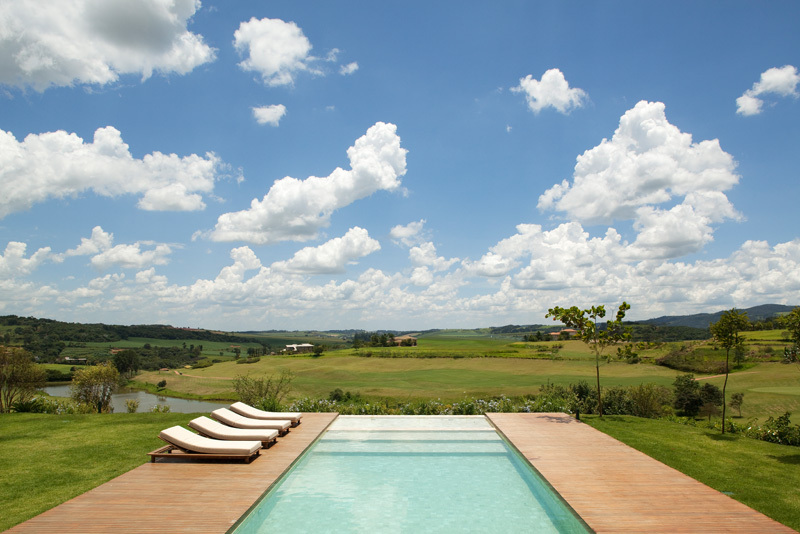 And that pool, adds more beauty to the home. 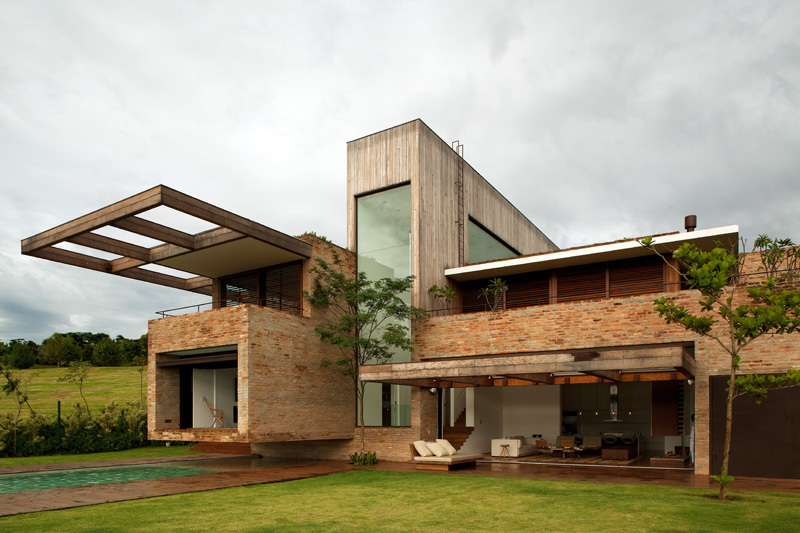 Wood and bricks look beautiful in the exterior and it has a green lawn on front of it as well as trees too. The house is indeed spacios and has many amazing features too. When one enters the volume, one finds a generous “horizontal opening on each side, a zenithal one above and a vertical one in front, all framing the bucolic landscape and bringing light to the staircase and all three floors.” Look at the dramatic lighting of the home! 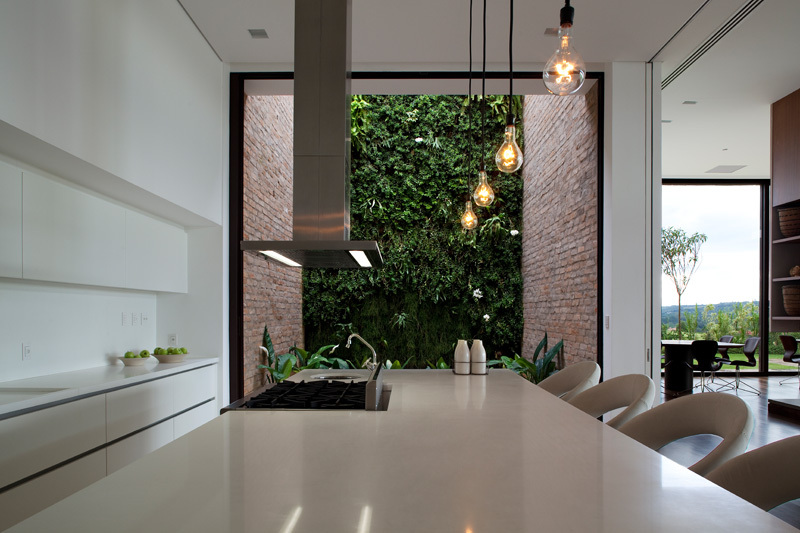 Of course, lighting is important in any home and we can also see that in this house too. Even the tree has a light on it. 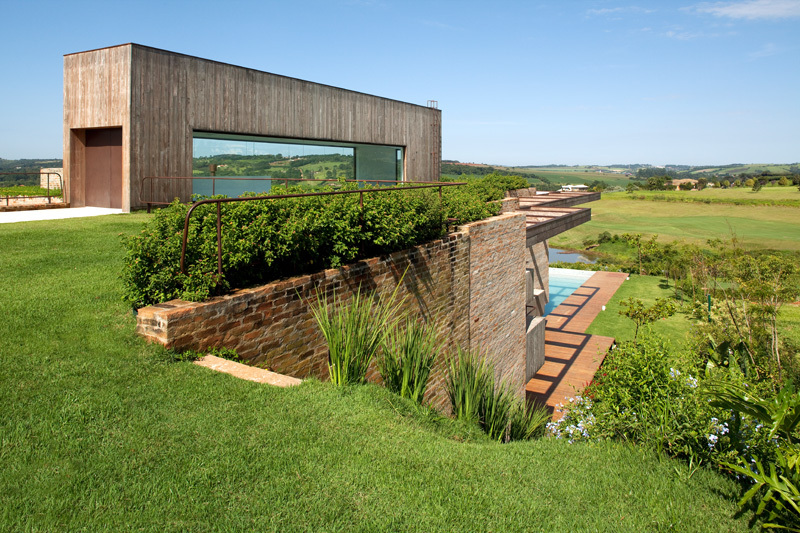 On this side, you can see that the house is indeed located on a steep sloping plot. And with the looks of it, the house is really spacious. In this photo, you can see that the upper area can be accessed through some brick covered steps that complements with the wall. 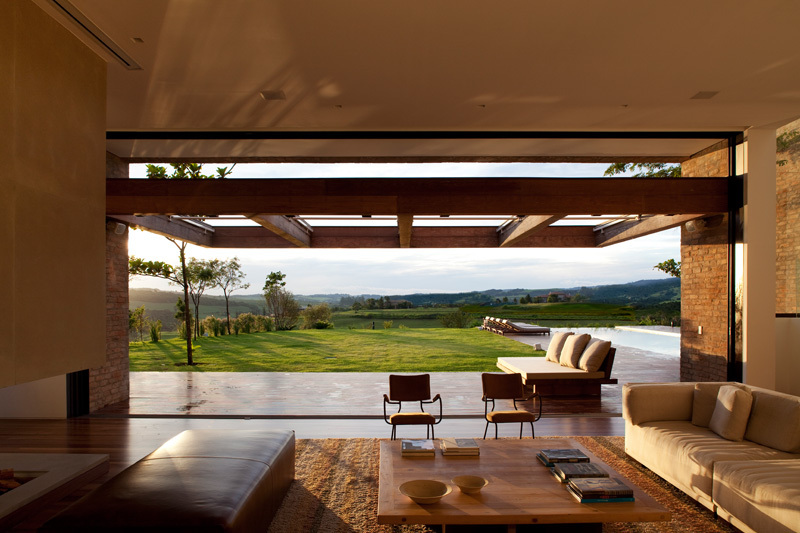 The house is located in the country and has a very relaxing and mesmerizing view around it. Look at all those greens around the home! Such a very beautiful sight indeed. On the first floor, the private areas of the house can be seen which is divided in two sections, one for the family and the other for guests. Isn’t this a very nice living area? And the view outside is very mesmerizing as well. 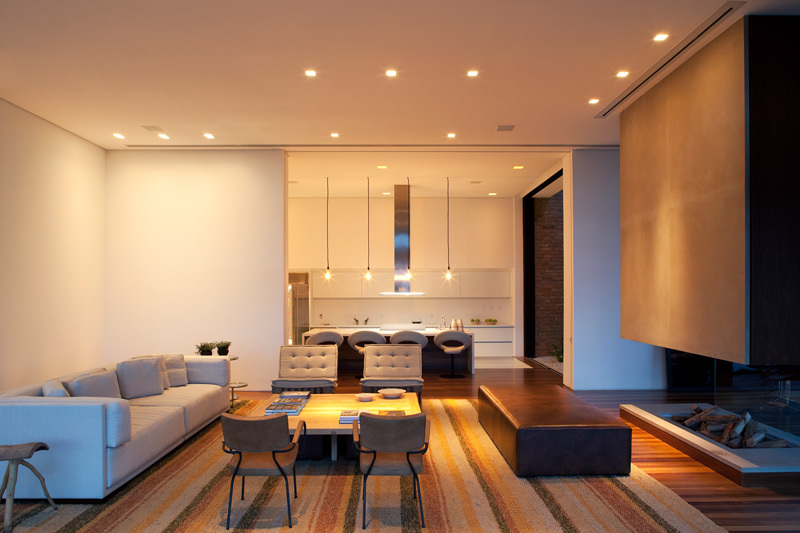 The area rug here adds appeal to the living room which seems to play well with the lights. It also use sleek furniture as well as a modern fireplace. Seen in the photo is the kitchen area with a kitchen island. It has wooden flooring and an indoor garden too. The kitchen is sunken a bit from the area where the island is placed. Interesting design, right? The kitchen has modern equipment that is used for preparing food. Its white color makes it look very elegant. It also looks even nicer with the indoor garden in it. Even the lighting looks elegant as well. 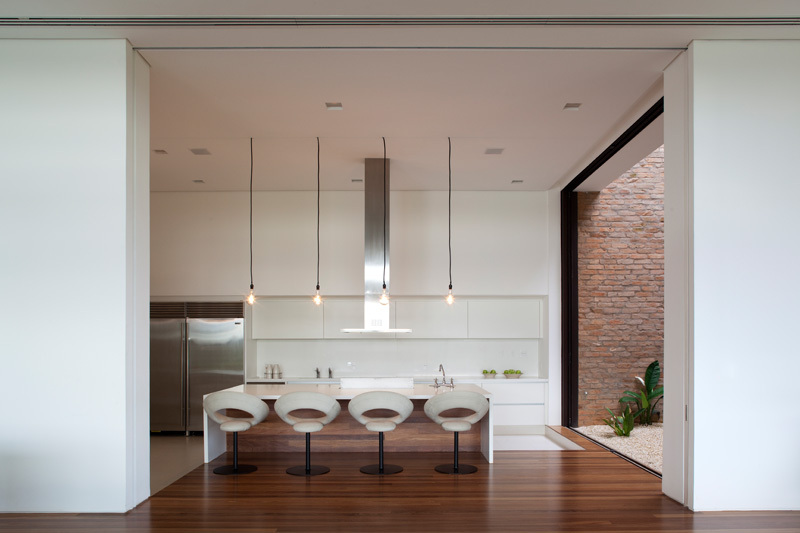 The interior of the house has high-quality furniture that is beautiful and sleek. 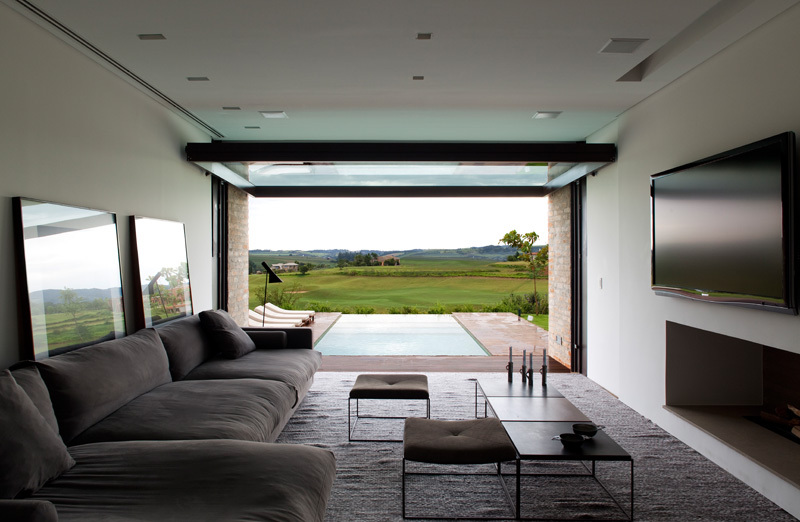 Notice that from the living room, one can access the infinity pool from outside that looks very inviting and grand. It also has a modern fireplace too wherein the television is added above it. The bedroom is very cozy with the soft area rug and the white colors in here. It also looks gorgeous with that lounge chair on the edge as well as the wooden features here. 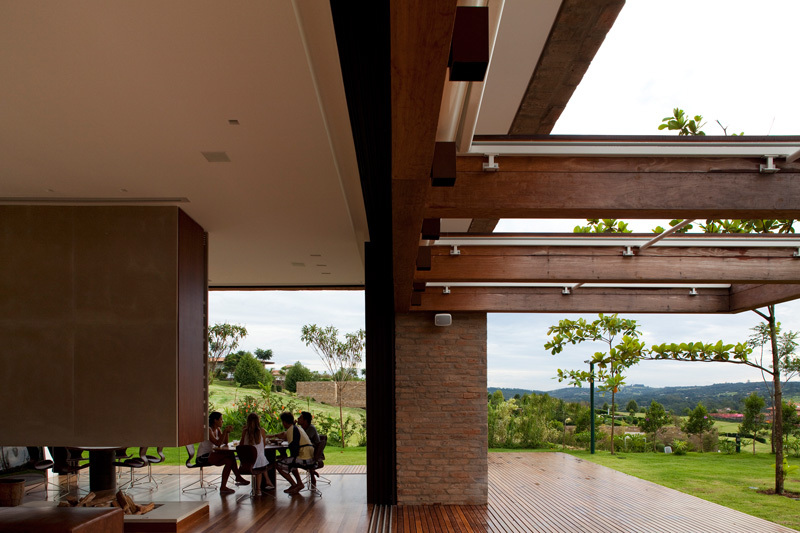 It has a huge window which allow the entry of natural light into the space. 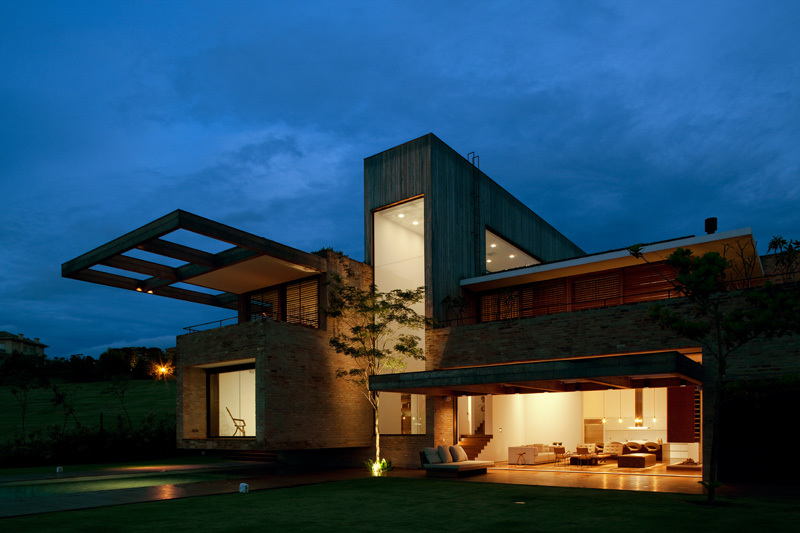 This house designed by Studio Arthur Casas is indeed beautiful and very impressive. You can see that aside from the gorgeous exterior, its interior is very cozy as well. It features everything one may need in order to have a well lived life in their own home. 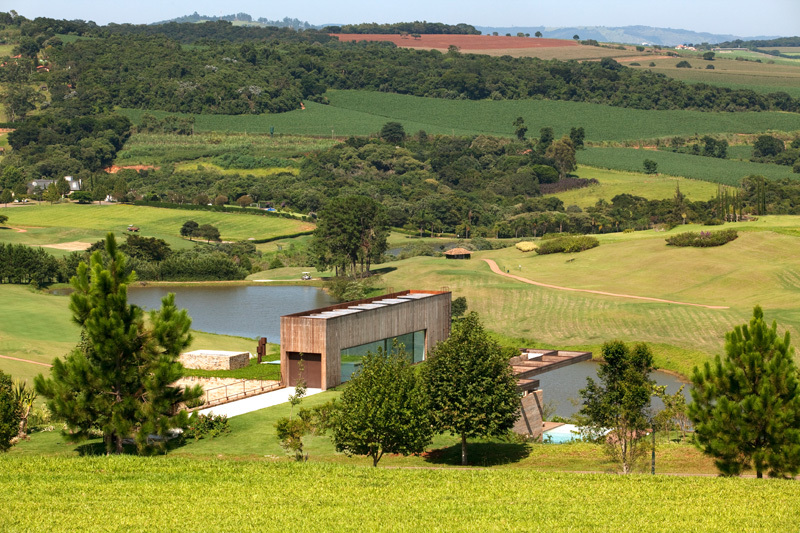 What makes this home even more gorgeous is the view around it and its natural surroundings.